My friend Eden and I began a ritual of tea and wine drinking in the Far East a few years ago. This year Eden chose Yunnan's Lijiang as our meeting spot. Eden generously put me up in the luxurious Banyan Tree Hotel. The view is stunning and the company is obviously more amazing. I've said many times that I am not one to sit on my hands, well, I sat on my hands for almost three days! Lijiang is one of those magical places that offers non-stop amazement. I experienced three different weather conditions in three days there! The first time I arrived in Lijiang, tired and unhappy, my driver did not greet me as promised and I was ready to be upset and just about to chew someone's head off. I walked out of the small airport terminal waiting for my driver, then all of a sudden I felt like someone had taken about 50 pounds off my shoulders. I was no longer upset and tired, just in a different state of mind that I didn't really understand, but I felt pretty good! Little did I know that the people of Lijiang are never in a hurry. You wouldn't be either if you've ever spent any time in this magical mountain town. I have come to love this little land of magical serenity. Last year I took a small group of fellow tea lovers to Yunnan and of course to this land of wonder, Lijiang. I think I can safely speak for the folks in the group that this place subtly changed all of our lives. The Banyan Tree Hotel is as magical as the town itself. It is more beautiful than I have any right to expect; for that I only have my friend Eden to thank. Without his generous offer I would be staying in a fine hotel, but nothing like this! The Banyan Tree, however, offers maddeningly slow internet connection, so the likes of me has no choice but to stop blogging and just let the magic seep in. I spent the three days drinking wine and cupping all of Eden's tea collection, as well as this year's Lotus Heart Dragon Well. Here in Lijiang, there is more magic that removes a mere mortal like me from the daily rat race and offers tea lessons at the same time. The 2,400-meter altitude makes water boil at around 85 degrees C. Surprisingly, that seems to give better texture and mouth feel to the puerh we cupped, especially the Purple Tip Puerh cake. The Lotus Heart Dragon Well turned out spectacular also. The Lijiang glacier water makes everything better and Lotus Heart was cupped at low temperature and performed as expected. Yesterday was my last day in Lijiang and amazingly, it turned out to be the special tea day. We decided to visit the Shu He old town. Walking among the marble stone trails and ancient buildings we happened upon the former home of the "Tea Horse King," allegedly the former home of the man who started the Tea Silk Road caravans. There I met Mr. Wang, whose business card named him as the fifth-generation head of the Tea Caravan. I spoke with him about the home, which is now part home, part museum, and part teahouse. We had to run take care of some business, so I told Mr. Wang that we'd be back to have tea and perhaps a bit of food before returning to the hotel for more wine. Upon our return, Mr. Wang had been called away. Disappointed and ready to leave, we found his cousin, Ms. Wang, who graciously offered us tea and a bowl of Puerh Noodles. The noodles were made by using flour and puerh tea instead of water. The simple vegetables were picked right from the fields next door and the noodles were delicious. The quality of the puerh tea offered was at best ordinary, but nonetheless the tea tasted sweet with smooth and thick viscosity. I asked for a fresh cup of water from the spring running literally a few feet away and found the water cool, sweet, and refreshing. It made an ordinary tea extraordinary and simple noodles fabulous. Combining this great water with a low boiling point due to the high altitude, I've learned why Lu Yu spoke so highly of the importance of water, including finding great water and learning to boil it at the correct temperature (Lu Yu said overboiled water is not usable). I came back to the hotel room with lighter steps and was again energized by the mystical powers of Lijiang. This morning I regretfully said goodbye to Lijiang and after a full day of travel, returned to Hangzhou. 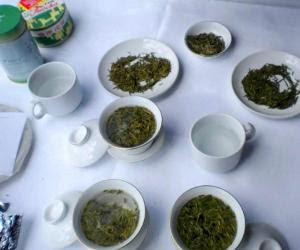 Tomorrow, a full session of cupping awaits; the day after concludes my tea run into China. I am off to Taiwan to take a look at the early harvested Imperial Green Oolong and finally, home sweet home. By the way, there are no "don't say yuk" moments in Lijiang! The flies, slow internet, not so great food, all are taken in stride. The only yucky thing is having to split town!